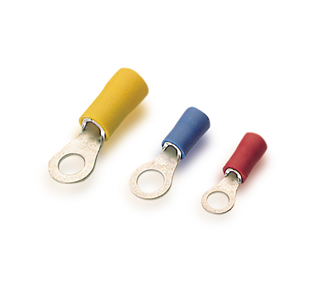 We are offering a wide selection Insulated Ring Terminals to the UAE market. We procure these highly effective and robust Insulated Ring Terminals from various reputed manufacturers and vendors all over the world and provide them to the various industries in Abu Dhabi, UAE. In the past few years, we have grown as one of the most reputed Insulated Ring Terminals Suppliers in Abu Dhabi, UAE. We have been supplying these Insulated Ring Terminals to the industries such as Power industry, Construction industry and Oil & Gas industry all over the UAE for quite a long time. We have established a large distribution network, which makes us capable of making timely deliveries of the products in any part of the UAE. Insulated Ring Terminals can be purchased from us at market leading prices. AT terminal manufactured from electrolytic copper strap with PVC insulation.